#ALDUBStayWithMe Keeping Divina a.k.a. YayaDUB away from Isadora is starting to get tougher. Lola Nidora is willing to pull off all the stops to keep Divina a.k.a YayaDUB away from her own mother. Her own mother. Details regarding Isadora’s loss of Divina are still sketchy by this time. But the ALDUB Nation tuned in to the ALDUB Stay With Me episode to see what reasons can Lola Nidora pull out again. Lola Nidora appeared in a Victorian gown. It looked a little like Belle’s gown in the Disney animated film “Beauty and the Beast”. The lovely gown failed to conceal the paranoia that Lola Nidora felt in the ALDUB Stay With Me episode. As always, she’s upset again with the Rogelio’s. “Bakit yung mga German shepherd sa mansion, hindi naman tumatahol? Malat na naman! Sinama nyo na naman manood ng concert.” (How come the German shepherd dogs at the mansion are not barking? They sound hoarse again! You took them to watch a concert again.) Seems like the inefficiency of the Rogelio’s got rubbed off on the guard dogs too. Hissy fits like the one shown in the ALDUB Stay With Me episode proved that Lola Nidora’s recovery is far from possible. Manic episodes like these make some fans think she might be bipolar. (Or borderline because she gets offended whether the intention is to piss her off or not.) Who knows if some of the medication included antidepressants and antipsychotics? She then called out for Divina a.k.a. YayaDUB for the medication. Donya Tinidora agreed. “Parang arrow ang legs nun eh.” (Her legs were like arrows.) YayaDUB is not always wearing shorts. And Donya Tinidora always felt proud of her legs. Hence the rather blunt comparison. The KalyeSerye commentators then requested for another Pabebe Girls DUBsmash in the ALDUB Stay With Me episode. Donya Tinidora was happy to oblige since she has mastered the lines with Nidora. Lola Nidora is happy at Donya Tinidora’s efforts in protecting Divina a.k.a. YayaDUB. “Kuhang-kuha. Buti na lang wala si Alden. Baka mamaya layuan niya si Yaya.” (Right down pat. Good thing Alden is not around. He might stay away from nanny.) Donya Tinidora disagreed. “Baka lalong ma-in love kamo!” (Say he might fall in love further!) Donya Tinidora DUBsmashed the other song associated with Divina a.k.a. YayaDUb – Selena’s “Dreaming of You”. Another attribute that gave Donya Tinidora away in the ALDUB Stay With Me episode was the talking. YayaDUB is still not in full control of her speaking voice. And she has yet to learn the art of sarcasm that has become Donya Tinidora’s trademark. 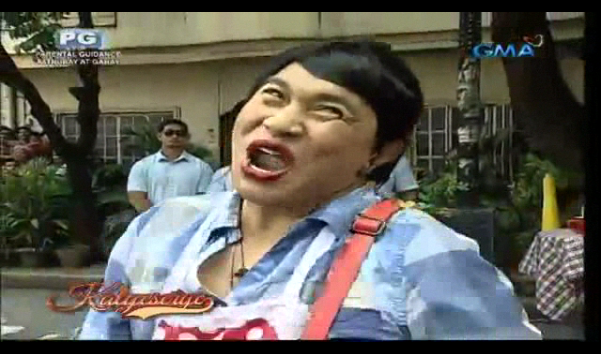 On the other hand, Donya Tinidora managed to copy YayaDUB’s trademark red lips. She may not always be wearing makeup while exercising her nanny duties. But it’s her most memorable feature to date. YayaDUB clearly knew Donya Tinidora enough to copy even the Chuckie Doll mannerisms. It pleased Donya Tinidora well. “Mabait na bata. Ang ganda ng ginagaya mo! Pati yung steps ha?” (Good kid. The person you’re impersonating is beautiful! You got even the steps!) Lola Nidora was blunt enough in admitting the little envy she felt. “Naiinggit ako sa inyo.” (I envy you.) Dawin’s song “Dessert” start playing in the ALDUB Stay With Me episode. Too bad the big ballgown Lola Nidora wore made it hard for her to dance. YayaDUB copied even Donya Tinidora’s feet with the toes on opposite directions. Donya Tinidora then reminded YayaDUB. “O tama na! Yung rambutan mo! Baka pati rambutan gayahin mo.” (Okay enough! Watch your lychees! You might copy even the lychees.) If ever there is one DUBsmash routine only YayaDUB can do, it’s the “Chinese DUBsmash”. 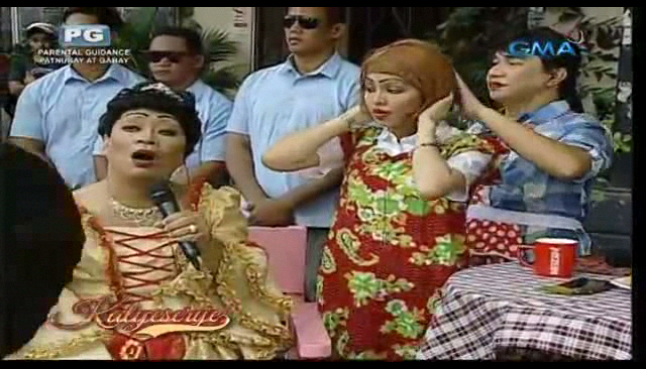 Lola Nidora then asked YayaDUB to beautify her face. (Without removing the Donya Tinidora cosplay.) She tried to go beautiful eyes on the camera along with the pouting lips. 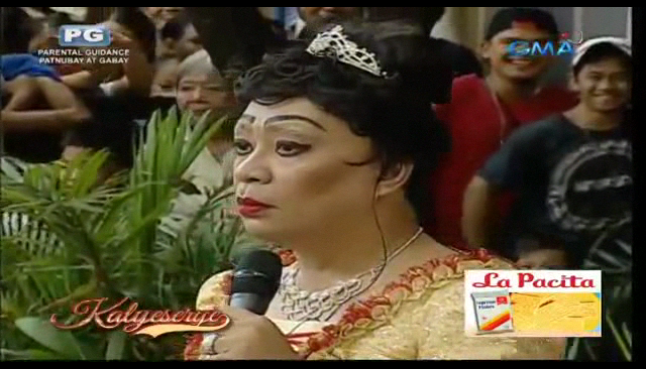 Lola Nidora is also aware of YayaDUB’s trademark lips. YayaDUB was game to play along in the ALDUB Stay With Me episode. Lola Nidora felt confident that even in this blotchy face. Alden will recognize YayaDUB. Lola Nidora thought that Alden has reached a point in loving her no matter what. “Kung mahal ka ni Alden, kahit anong hitsura mo, matatatanggap ka ni Alden. Yung iba, nagka-pimple lang, maghahanap na ng iba.” (If Alden loves you, no matter your appearance. Alden will accept you. Others lose interest at the sight of a pimple.) Bossing Vic can’t help but comment though. “Pero kung yan naman ang itsura ni YayaDUB.” (But if YayaDUB looked like that.) He couldn’t finish his sentence in the ALDUB Stay With Me episode. But he clearly pointed at Donya Tinidora in YayaDUB cosplay. Lola Nidora continued. “Yun ngang magkakapatid, may lukso ng dugo. Yung nagmamahalan, pag nagkasulyapan, may lukso ng puso.” (If siblings have the blood lines active. Those who are in love have their love lines active.) Donya Tinidora helped YayaDUB later with her hair. The ornament usually associated with the Kalye’s Angels is falling off her wig. And Donya Tinidora proved to be YayaDUB’s kindred spirit indeed. They DUBsmashed The Corrs’ “All The Love in the World” together. It would further confuse Alden had he been around in the ALDUB Stay With me episode. Lola Nidora was almost apologetic. “Alam ko nahihirapan ka sa mga nangyayari. Pero kasi natatakot ako na kunin ka at ilayo ka sa amin ni Isadora. Ikaw, si Tinidora, si Tidora ang pamilya ko. Isa lang ang mawala sa inyo, hindi ko kakayanin.” (I know you are having difficulty with these situations. But I am afraid that you be taken away from us by Isadora. You, Tinidora and Tidora are my family. I lose one of you and I can’t take it.) She emphasized the importance of family in the ALDUB Stay With Me episode. It quite contrasted with her distrust of Isadora though. Then again, why would Isadora go to such lengths in taking Divina a.k.a. YayaDUB away from them? Lola Nidora then told herself in a way that everyone can hear. “Lagi ko na lang tatandaan. Kahit maraming problema. Hindi ako nag-iisa dahil sa aking pamilya.” (I will always remember. Even if there are so many problems. I am not alone because of my family.) 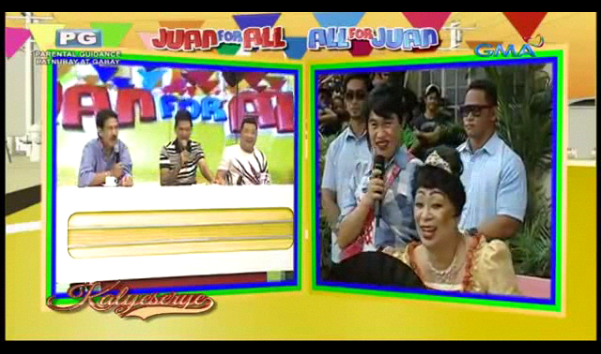 Baste and YayaLUVS even appeared on the other monitor to appease YayaDUB and the grannies at the ALDUB Stay With Me episode. Baste himself got confused with YayaDUB and Donya Tinidora. He then ended up finding both of them ugly. “Hi, Yaya! Pangit ka, Yaya!” (Hi, nanny! You’re ugly, nanny!) Of course he would often end his sentences with “Joke lang!” (Just joking!) It was in the middle of Baste’s antics when Lola Nidora received a phone call. Apparently, Isadora got hold of Lola Nidora’s phone number too. The ALDUB Stay With Me episode pushed her into paranoia again. No sightings of the spying woman so far in the ALDUB Stay With Me episode. So no opportunity to confirm if ever the spying woman and Isadora are one and the same person. This is where the ALDUB Stay With Me episode switches to Scream mode. Except that the caller is not shown in a mask. In fact the caller is not shown at all. But she can manage to describe Lola Nidora’s appearance. A clear sign that the disguise operation is not as effective as far as Isadora is concerned. Lola Nidora pretended that she is not affected with Isadora’s threats. “Wag kang manakot dahil hindi ako natatakot!” (Don’t threaten me because I am not threatened!) She was in denial of Isadora’s real-time sightings. “Hindi ako naka-gown! Hindi ako nakatayo! Wala ako sa kalsada!” (I am not wearing a gown! I am not standing! I am not on the street!) Right when she mentioned standing, she sat down. Whether Isadora enjoyed the mind games, no one can tell. Still no sighting of the spying woman at the ALDUB Stay With Me episode. Isadora mentioned on the phone even Lola Nidora’s crown. Lola Nidora was aghast. “Korona? Anong korona? Buhay pa ko!” (Crown? What crown? I’m still alive.) She made it sound like Isadora was referring to a crown of flowers for the funeral. Donya Tinidora was alert enough to ask her who the caller was. Lola Nidora had to admit talking to Isadora. And she can see everything where she may be at the ALDUB Stay With Me episode. “SI Isadora ang tumawag. Bakit kailangang gawin niya ito sa atin?” (Isadora called. Why does she had to do this to us?) Lola Nidora had to share what she knew about Isadora that was not mentioned in the ALDUB Getting Closer episode and ALDUB The Revelation episode. “Si Isadora ang spoiled brat naming kapatid. Nalulong siya sa bisyo noon. Umiiyak ang Mama hanggang malagutan siya ng hininga.” (Isadora is our spoiled brat of a sister. She got into several vices then. Mama cried for her until the day she died.) She then looked around to check where had she been viewing Lola Nidora. Lola Nidora continued. “SI Isadora ang suwail na anak. Ang suwail nating kapatid. Nung nag-aaral kayo sa abroad. Itinago ni Mama ang problema niya kay Isadora. Ako ang kasama noon ni Mama. Umiiyak siya dahil sa kagagawan ni Isadora.” (Isadora is the prodigal daughter. Our prodigal sister. While you were studying abroad, Mama hid her problems with Isadora. I was with Mama then. She cried because of Isadora.) The ALDUB Stay With Me episode tried to close the gaps left by ALDUB The Revelation episode. Obviously, Isadora was off the radar when Tidora and Tinidora had searched for her months ago. Now Lola Nidora’s reasons behind not joining in the search for Isadora have been revealed. She did not want to be found. She’d rather go for the pounce when Lola Nidora is least aware of it. Lola Nidora was at the height of her paranoia when she noticed only one Rogelio is left behind her. Lola Nidora is running out of ideas on how to keep Divina a.k.a. YayaDUB away from Isadora. “Kasi naman, Yaya, wala na kaming maisip na ibang paraan. Sina Rogelio, hindi ko alam kung nasaan.” (Nanny, we can’t think of any other way. I don’t know where the other Rogelios have gone.) Lola Nidora planned to face Isadora with Donya Tinidora with YayaDUB not around. YayaDUB does not agree with Lola Nidora’s plan. With YayaDUB refusing to hop into the getaway vehicle. Lola Nidora scolded her. “Ano ba naman, Yaya? Anong gusto mong gawin ko? Araw-araw akong nag-aalala! Hindi ko alam anong kaya niya!” (What the heck, nanny? What do you want me to do? I am worried everyday! I don’t know what is she capable of!) It did not appease YayaDUB in the ALDUB Stay With Me episode. She even cried while hugging Lola Nidora. Even Baste ended up teary-eyed as if he partly understood what’s happening in the ALDUB Stay With Me episode. Lola Nidora appeased him shortly before going back to Divina a.k.a. YayaDUB. “Sige na, Yaya, dumarami na ang tao.” (Go ahead, nanny. The crowd is getting thicker.) YayaDUB refused to go and ran away from the getaway vehicle instead. The truck horn honks to signal the end of the episode. Divide and conquer seems to be Lola Nidora’s strategy in keeping Divina a.k.a. YayaDUB away from Isadora. Whether Isadora’s reasons behind taking her daughter away from Lola Nidora and her twin sisters are selfish or not, only Isadora knew. Tune in to Eat Bulaga regularly to see what other tricks does Isadora have up her sleeve. Eat Bulaga is aired Monday to Saturday at noontime. Like Eat Bulaga’s official Facebook page to view the ALDUB Stay With Me episode replay. So much has happened and still no Alden Richards. But the archive found here at The Philippines Web helped in spotting discrepancies in the triplets’ story, if any. What other secrets threaten the bonds here at the ALDUB Stay With Me episode. Follow us on our social media accounts for the updated articles. Like our official Facebook page, The Philippines Web. And follow us on Twitter @pinasamazing. We’d be expecting you.